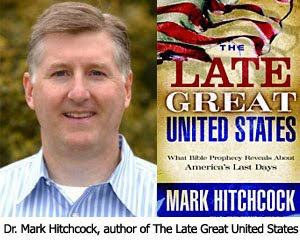 Can the United States of America be found in Revelation 12? The US in Revelation 12? Dr. Reagan: Revelation 12 foretells there is going to be a great war in the middle of the Tribulation. Satan will be cast down to earth. He will come down in great wrath. He is going to posses the Antichrist and motivate him to destroy and annihilate the Jewish race. Revelation 12:14 says that as he begins to come against the Jews they will flee into the wilderness on the wings of a great eagle. People read this and say, "Uh-huh, there we are, there is the United States in Bible prophecy, because the symbol of our nation is an eagle. Therefore, we are going to provide the end time airlift for the Jewish people." Dr. Hitchcock: I would see that reference of "the two wings of a great eagle" there as the fleeing Jewish people are given protection by God who gives them speed and swiftness to be able to flee into the wilderness and be protected. To me, if someone is going to build a whole case that America is in Bible prophecy just because of the mention of an eagle, then they will have to go to the other places in the book of Revelation. Revelation 8:13 also says there is an angel like an eagle flying in the mid-heavens proclaiming the gospel. Is that eagle the United States as well? Revelation 12 is an even more tenuous evidence that the United States is in Bible prophecy than making the young lions of Tarshish in Ezekiel 38:13 refer to America. Dr. Reagan: I would agree. When you come to symbolic phrases like "the wings of an eagle," the best thing to do is to search with a concordance or computer on that term. You'll find the exact same words in Exodus 19:4 and in Deuteronomy 32:11 where it says that the children of Israel came out of Egypt on the wings of a great eagle. All it means is that they are coming out under the protection of Almighty God. Dr. Hitchcock: That is right. With speed and with swiftness they are coming out. People tend to just grab onto very small statements in the Bible and build a whole doctrine around them. That is a warning I think, a good warning to all of us to be careful about not doing that.